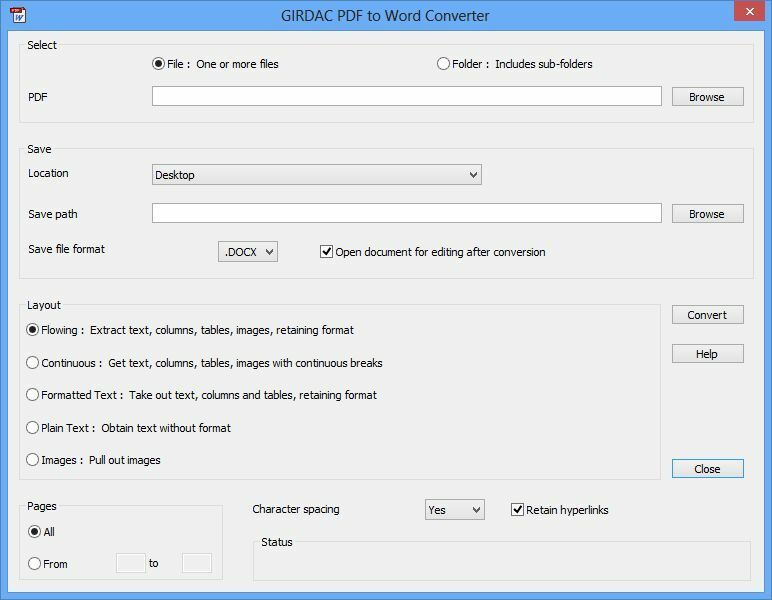 GIRDAC PDF to Word Converter is a software application for converting PDF documents to Microsoft Word .DOC .DOCX .XML and .RTF file formats and plain text file. It extracts images from PDF documents. It converts PDF documents with five Layout options: (a) Flowing: Converts PDF documents retaining the format with text columns tables and images. (b) Continuous: Converts PDF documents picking out text columns tables and images with continuous breaks. 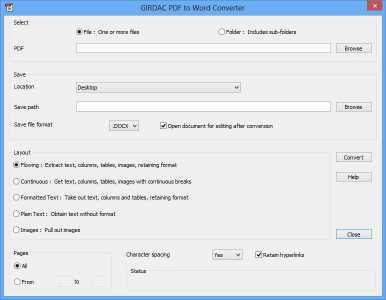 (c) Formatted text: Converts PDF documents retaining the format and text discarding images. (d) Plain text: Converts PDF documents by extracting text without format. (e) Images: Converts PDF documents by picking images only. It makes converted document easily editable. It supports 115 user interface languages: Afrikaans Albanian Amharic Arabic Armenian Azerbaijani Bangla Basque Belarusian Bosnian Bulgarian Burmese Cantonese Catalan Cebuano Chichewa Chinese Chinese Simple Corsican Creole Croatian Czech Danish Dari Dutch English Esperanto Estonian Faroese Fijian Filipino Finnish French Frisian Galician Georgian German Greek Gujarati Hausa Hawaiian Hebrew Hindi Hmong Daw Hungarian Icelandic Igbo Indonesian Irish Italian Japanese Javanese Kannada Kazakh Khmer Korean Kurdish Kyrgyz Lao Latin Latvian Lithuanian Luxembourgish Macedonian Malagasy Malay Malayalam Maltese Maori Marathi Maya Mongolian Nepali Norwegian Occitan Otomi Papiamentu Pashto Persian Polish Portuguese Punjabi Romanian Russian Samoan ScotsGaelic Serbian Sesotho Shona Sindhi Sinhala Slovak Slovenian Somali Spanish Sundanese Swahili Swedish Tahitian Tajik Tamil Telugu Thai Tongan Turkish Ukrainian Urdu Uzbek Valencian Vietnamese Welsh Xhosa Yiddish Yoruba and Zulu. It supports 32-bit and 64-bit operating systems.